The first multi-stakeholder discussion on this topic was organized by HRNS on behalf of the initiative for coffee&climate and CIAT in July 2017. It aimed to reveal the major issues caused to the Vietnamese coffee sector by the changing climate and develop an action plan on a national level. Forty participants of the workshop represented all fields of the industry – government’s agencies (MARD, DARD, IPSARD), roasters (JDE, Nestle, MERCOFFEE), research institutes (WASI, Tay Nguyen University), traders (ECOM, DAKMAN, SIMEXCO, Louis Dreyfus), platforms (IDH, UNREDD, GREENcoffee, BMT Coffee assosiation), and farmers from the Central Highlands. These words of the vice director of WASI Mr. Thuonghe emphasize the importance of sharing research findings as a cornerstone for the future action plan and thus perfectly summarizing the main goal of the workshop. Without comparing data from various institutions, it would be impossible to work out effective policies to deal with the climatic turbulences that are threatening the coffee sector. In his presentation “Sustainable Coffee Production under Changing Climatic Conditions” Dr. Dave D’haeze from HRNS explained how weather conditions determine the quality, yield and production costs of coffee, affecting the whole supply chain from farmers over traders and exporters to roasters. 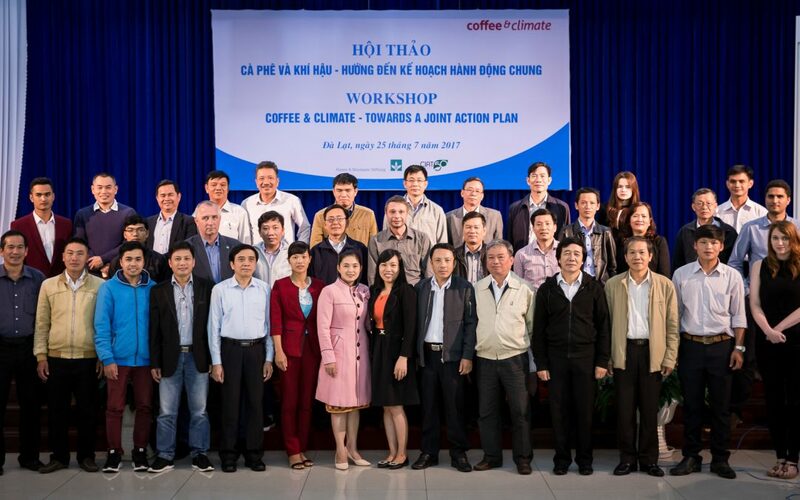 Dr. D’haeze showed the climate change adaptation options for the Vietnamese coffee sector and emphasized the importance of collective effort in addressing the issue. CIAT’s research results were presented in Orla O’Halloran’s report “Main findings from the c&c survey conducted by CIAT”. She introduced the survey methods for each of the aspects of coffee growing, revealing main issues as well as suggested solutions. Mr. Vu Thai Truong shared the results of UNREDD work in his presentation “How existing and/or planned programs/projects are operating to cope with climate change in coffee production”. The main focus was on the various applications of the REDD+ project in Vietnam. During the plenary discussion, all representatives had a chance to discuss the challenges in their segments of coffee production and to give critical feedback to current programs geared towards climate change adaptation. Topics such as the pros and cons of intercropping, switching to smart fertilizers with reduced carbon footprint, selective introduction of new climate resilient coffee varieties, fees for water use and many others were brought to audience’s attention and documented by delegates. Moving from theory to practice the participants were divided in four groups to brainstorm all possible solutions for four major issues – irrigation, pests and diseases, fertilization and postharvest processing and coffee quality. An hour later the groups reported their results to the audience. The next stakeholder convening is tentatively planned for the 3rd quarter of 2017 aiming to discuss policy changes, monitoring activities and a strategic action plan for 2018.